Once when a renowned Bharatnatyam dancer was asked, how she could portray Lord Krishna and his laugh so perfectly each time she went on stage – she said that she had repeated that ‘pose’ a million times before the mirror to have gained this perfection! My mother fondly remember the great dancer Gopi Krishna – a Kathak maestro – who would announce that he is going to shake only one bell out of the countless bells tied to his feet – and how he would come close to the mike and jerk just that one tiny nerve to make that single bell resound to thundering applause! What can one say about India’s Classical dance forms – that when nearly the whole world literally dances to one form of classical dance – the ballet – in India you can witness several classical dances. The most famous classical forms are BHARATANATYAM of Tamilnad, KATHAKALI and MOHINIYATTAM of Kerala, ODISSIof Orissa, KATHAK of Uttarpradesh, KUCHIPUDI of Andhrapradesh and MANIPURI of Manipur. There are many types of dance in India, from those which are deeply religious in content to those which are danced on more trivial happy occasions. Classical dances of India are usually always spiritual in content, although this is often true also of Folk dances. The navarasas, or nine emotions, give all dance a completeness that allows the dancer and the rasikas (audience) to experience the full beauty and meaning of the lyrics and the movements they are portrayed by. 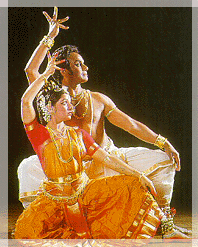 In Indian tradition dance was a divine dimension of the man's act. Read a great article by Prof. P.C. Jain and Dr Daljeet. An archive of articles pertaining to Odissi and other Indian classical dances.